When a wine is great, it can slip through your fingers, making description a real struggle. 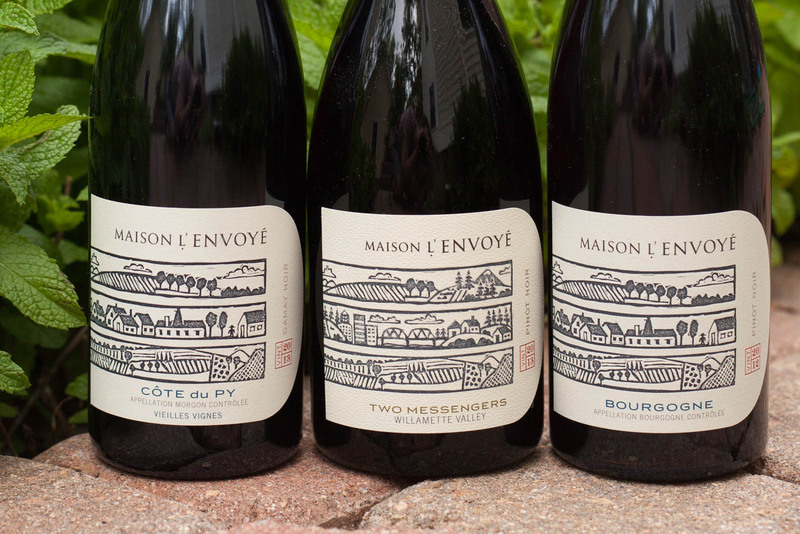 On back-to-back weekends, I had wines that nearly bankrupted my ability to write accurate tasting notes. The first was a 2010 Pio Cesare Barbaresco, which I wrote about last week. 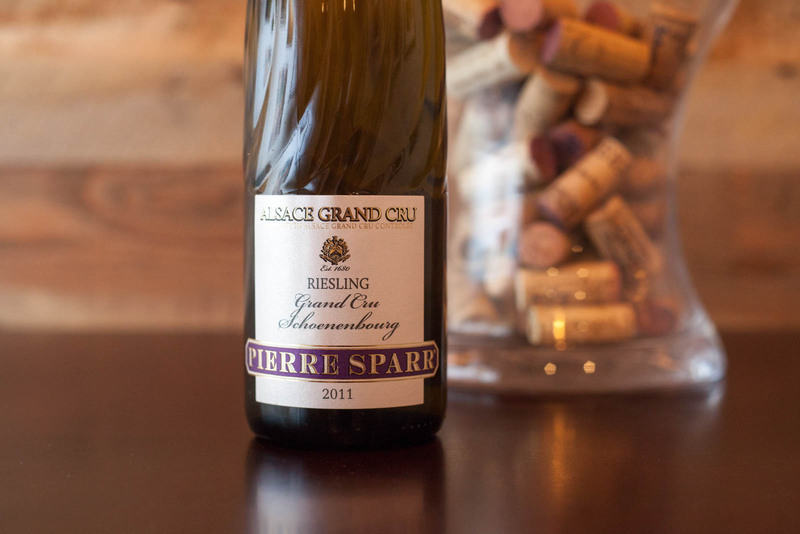 The second was the 2011 Pierre Sparr Riesling Grand Cru from the Schoenenbourg vineyard near Riquewihr in Alsace. Each sip of this brilliant Riesling rested on my palate like a feather. It was delicate and sensual at first, slightly sweet and honeyed in texture, and then — like the very best Rieslings — it did a little magic trick: it came off the palate clean and crisp with a stony finish that invited another sip. In other words, it possessed a kind of sweetness that didn’t stick to the sides of your mouth and exhaust your palate. It simply vanished, leaving a stony-floral feeling in its wake. Steadily, I’ve been enjoying the white wines of Alsace this year, mostly through a single, easy-to-find producer, Pierre Sparr. Perhaps its their crispness, or their mosaic of flavors, but for some reason, the Alsatian whites of Pierre Sparr hit all the right buttons for me. Their Gewürztraminer transports me to the tropics, with a dance of lychee, grapefruit and lavender that segues nicely to an apricot finish. Often, Gewürztraminer can be overbearing in its zestiness, but this one is just right. Their Pinot Gris rivals many of my favorites from Oregon, and their entry-level Riesling has incredible structure and endurance, allowing stingy home chefs like me to nurse it over the course of three or four weeknights without it fading. 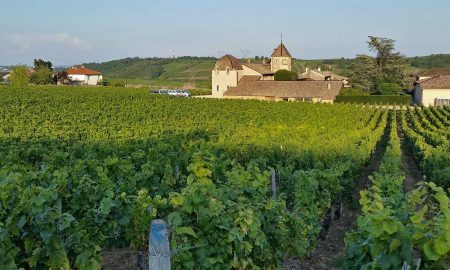 So when we opened the Grand Cru Schoenenbourg, my expectations were admittedly high. Riquewihr is home to the Schoenenbourg Grand Cru vineyard and is considered one of the prettiest villages of Alsace. 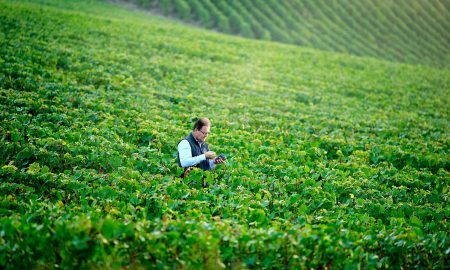 Classifying wines as Grand Cru in Alsace is a rather new invention. 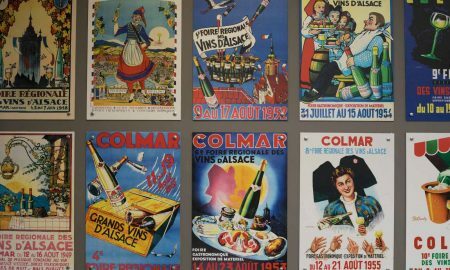 Alsace wines have always been unusual for France — in fact Europe as a whole — in that they are labeled by the grape varietal, not the town or appellation of origin. Therefore, where the grapes grew and the terroir they expressed was never really the headline. It was always the grape. 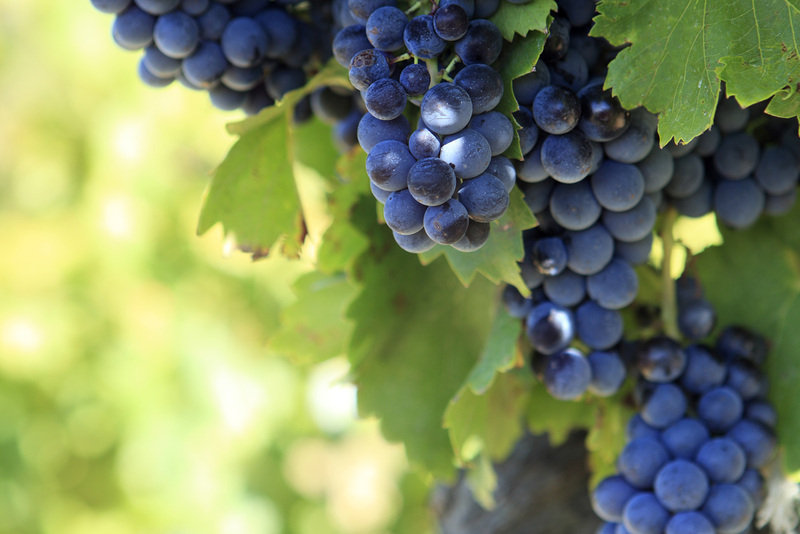 Yet, to increase their prestige and reputation, they designated their best vineyards as Grand Cru beginning in 1983. While the intention may have been commercial, this was no gimmick. 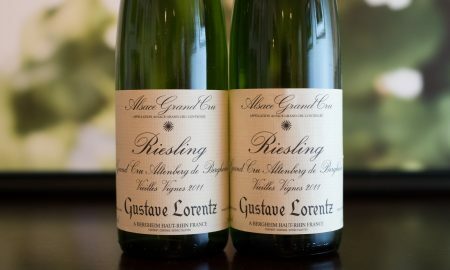 Riesling fanatics often point to certain Alsatian sites — such as Clos Ste-Hune atop the Rosacker Grand Cru vineyard — as producing the best Riesling on earth. 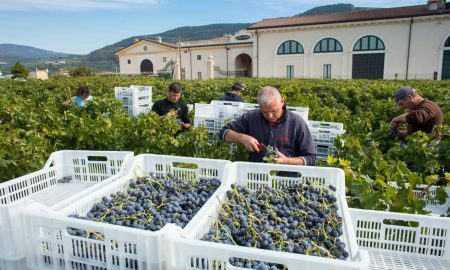 And furthermore, producers have always had an eye on matching the right grapes to the right soils and exposures throughout the area. 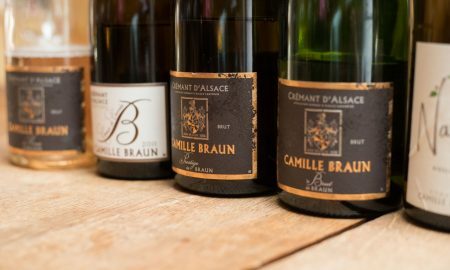 Grand Cru wines exist for not just Riesling, but also Gewürztraminer and Pinot Gris. The Schoenenbourg vineyard above Riquewihr, France. But its Riesling that remains the star. 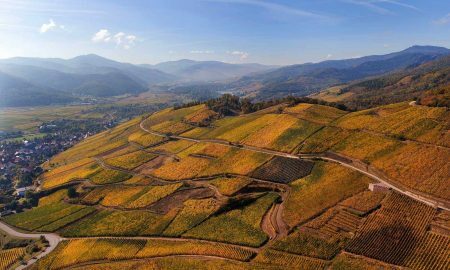 Compared to much of France, Alsace is extraordinarily sunny and unusually dry — thanks to the “rain shadow” created by the Vosges Mountains to the west. 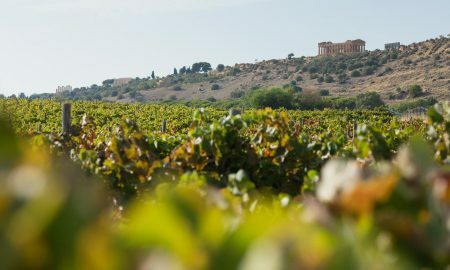 This microclimate makes it the ideal region for bolder, crisper renditions of Riesling, and those made from grapes grown on the clay marls of Grand Cru vineyards such as Schoenenbourg — where Voltaire once owned acreage of vines — are said to be among the finest because of the flinty note that hangs on the finish. 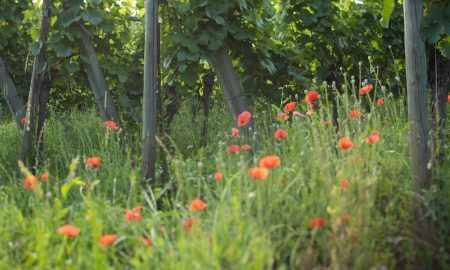 I’d be curious to line this wine — and others from Alsace Grand Cru vineyards — against some of Germany’s finer Rieslings to note the differences. I’ve sampled several from the Mosel, including bottles from the famous Wehlener Sonnenuhr and the Bernkasteler Doctor vineyards. How would they compare? Would their personality come to the fore even more? 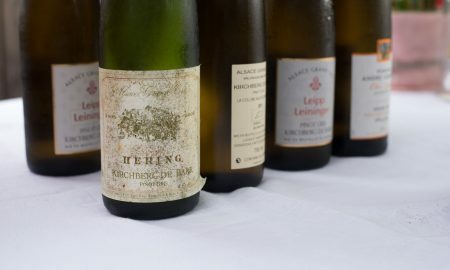 Even without the side-by-side, I could tell that the Pierre Sparr Riesling from Schoenenbourg differed greatly from their German cousins in one dramatic way: it felt fresher and more vibrant, without the petroleum note that tends to make some Rieslings (especially German ones) feel quirky, old and bogged down. It was a delight to drink, and it was gone in a flash. Grand Cru or not, I’ll be on the hunt for more Alsatian whites — and maybe a bottle of their unheralded Pinot Noir — for years to come. Tasting notes: A wonderfully balanced Riesling with bright aromas and flavors. On the nose, it recalls freshly cut apples, honey, white flowers and a bit of tea aroma. The palate is extraordinary, with slightly sweet and honeyed in texture but also enough acidity to create a lasting, mineral finish. Recommended for: Riesling is one of the greatest wines to pair with spicy dishes, and this wine would pair excellently with Indian cuisine such as potato samosas like these from Padhu’s Kitchen. We served it as an apéritif before a big meal, so also flag this one for Thanksgiving. 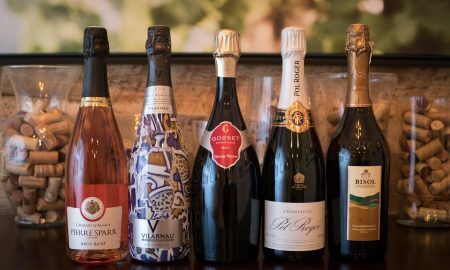 Note: Pierre Sparr wines were provided as samples by Wilson Daniels. Read more about our editorial policy.